When creating a custom command object, you can use either a RoutedCommand or a RoutedUICommand object. Using the RoutedUICommand object allows you to associate some text with the command, using its Text property. This text is typically the text that you want the user to see in the user interface. Below, we create a new command and set its text. 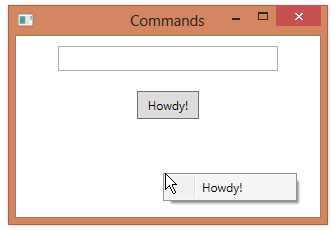 In XAML, we reference the Text property for a button’s content. Note that we don’t need to specify text for the MenuItem–it will automatically get the text from the RoutedUICommand. Your link for creating a custom command object is trying to bring me to the admin edit page.